Hi all! I hope you are just knee deep in holiday celebrations and fun by now- I most definitely am. 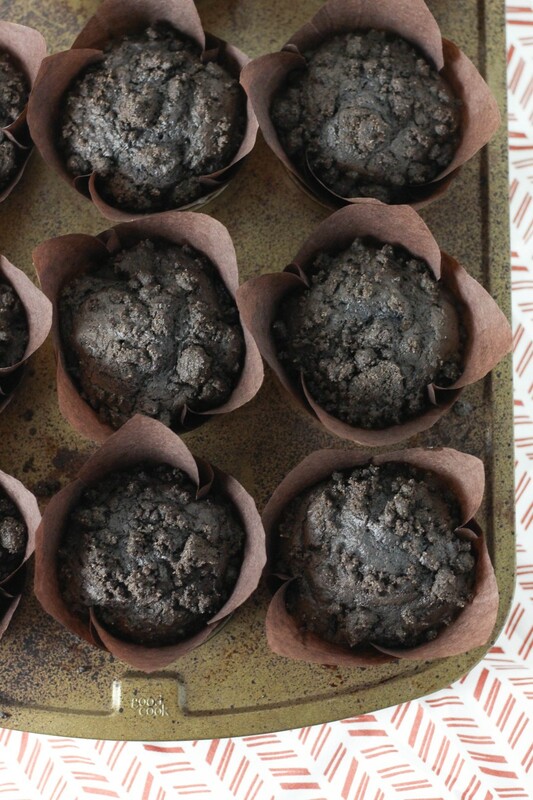 I’m counting muffins as a holiday treat because let’s face it- tis the season to call cake a breakfast item, right?? And anyways, I know chocolate and blueberries kind of sound like a weird combo, but it’s actually super good! 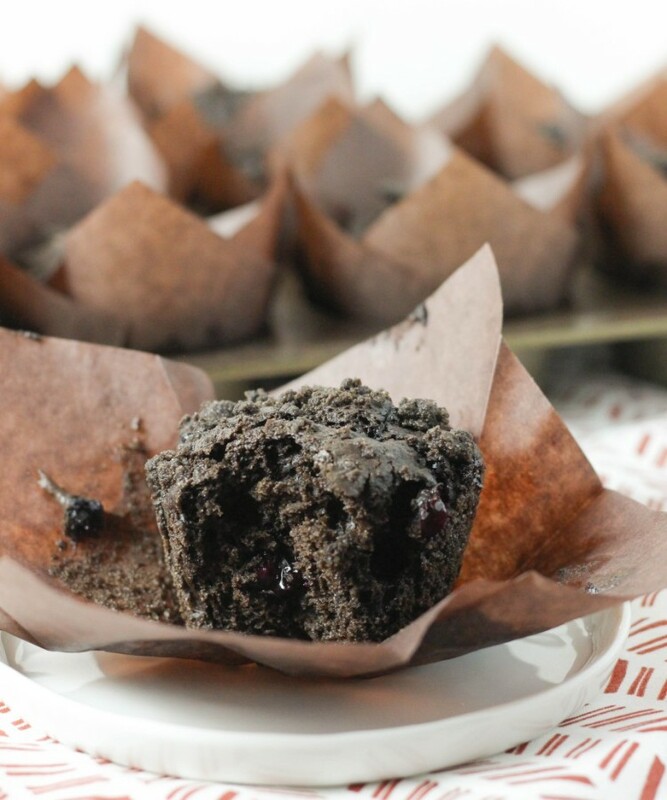 You get the strong flavors of chocolate, dotted with juicy blueberries and the effect is pretty dang good, especially when you top it with a chocolatey crumb. 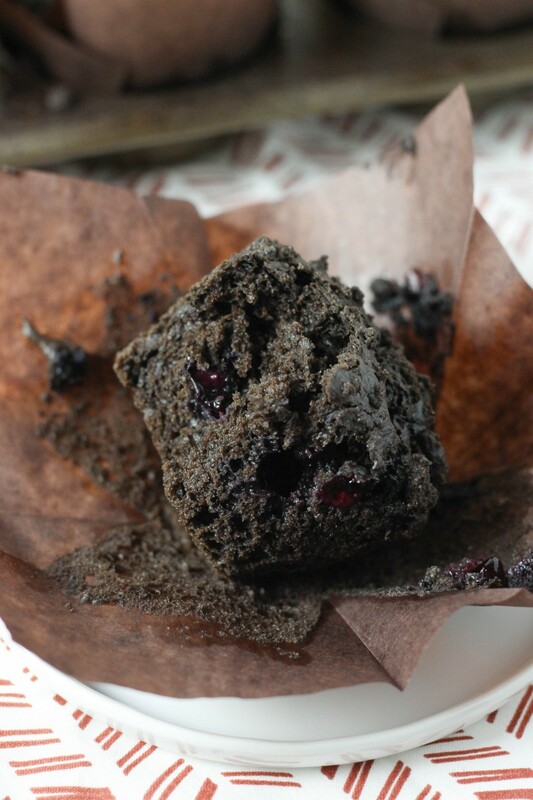 I use dark chocolate cocoa powder because it gives me that super strong chocolatey flavor, and it makes the muffins this pretty deep dark color. 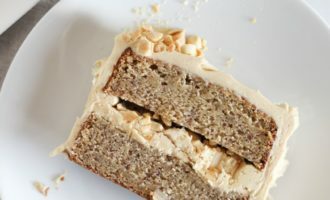 I’m a fan of crumb toppings in general tbh- I’ve made tons of different crumb cakes on the blog because it’s such a good combo. This is no exception, although this crumb is fairly different than others I have made. 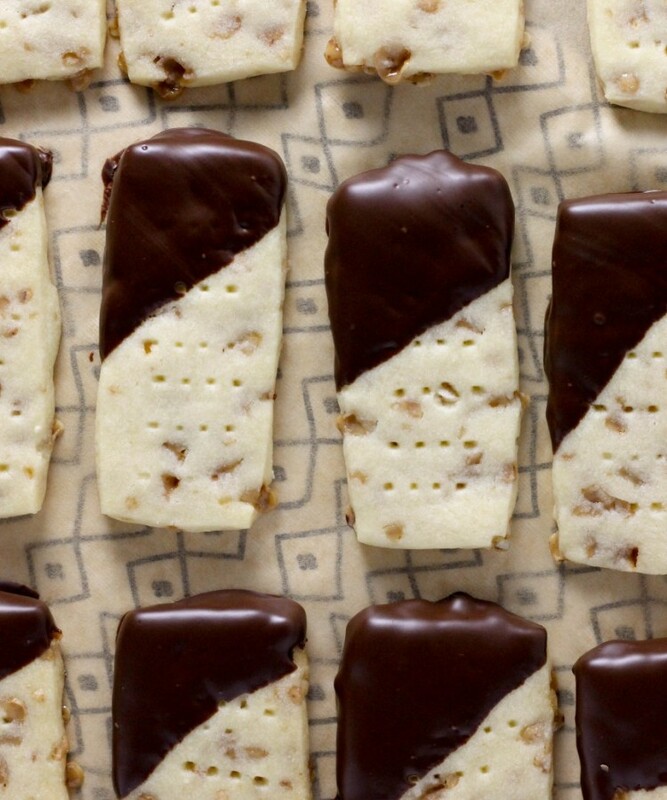 Primarily because it’s flavors are heavy on chocolate instead of brown sugar and cinnamon. Regardless, it fits in perfectly with these muffins of course! 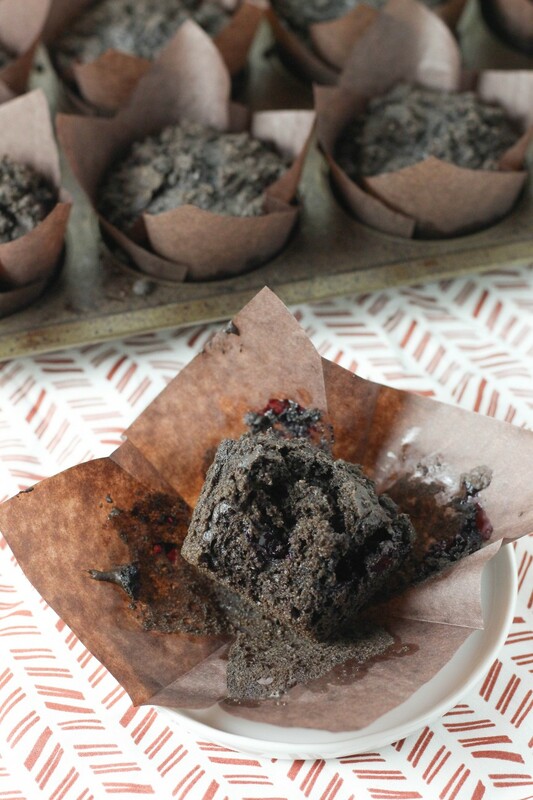 And if you’re hosting any guests this holiday season, I feel like muffins are the right choice. It’s an easy breakfast or quick little midnight snacks for guests, and it won’t leave you slaving over the stove in the morning. Win-win. And yet another win- muffins are too easy to make man. You can just stir these together by hand, no mixer needed. 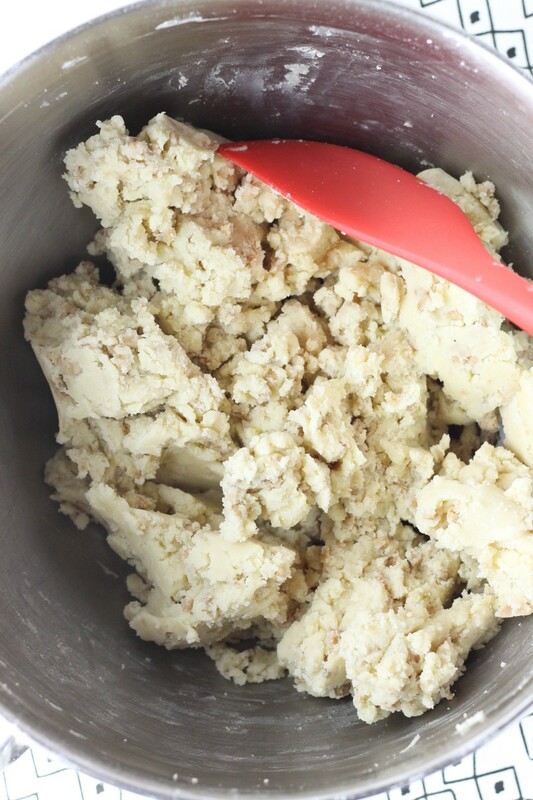 In fact, it’s better to mix them by hand because you really don’t want to over mix the batter- it can lead to tough muffins. That sounds like a slogan or something to tell your kids right? You can’t always get what you want- tough muffins! Alright anyways, enjoy it, it’s really nom you guys. Preheat your oven to 375 degrees, and line a muffin tin with paper liners. Set aside. 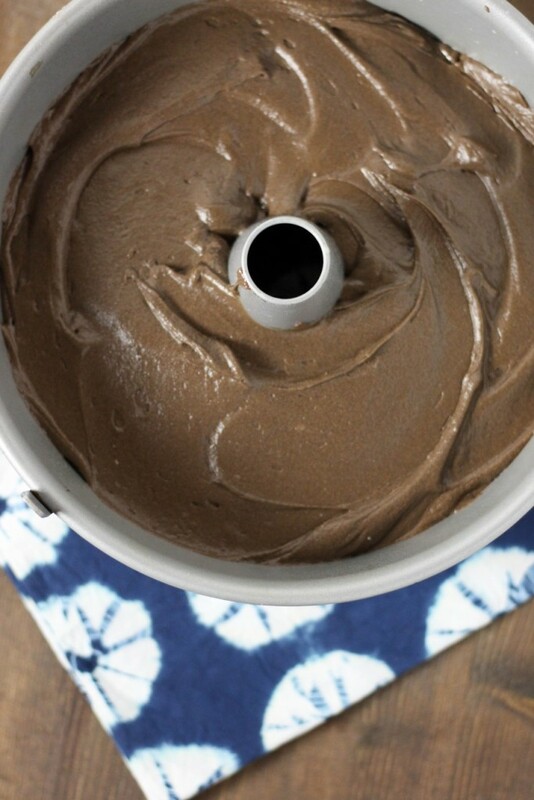 In a large bowl, stir together the flour, brown sugar, cocoa powder, baking powder, baking soda, and salt. Set aside. In a medium bowl, whisk together the melted butter, buttermilk, eggs, and vanilla. Add the wet ingredients into the dry, and stir gently with a spatula or large spoon. Just before the flour is completely mixed, add in the blueberries and gentle finish mixing. The batter will be lumpy. 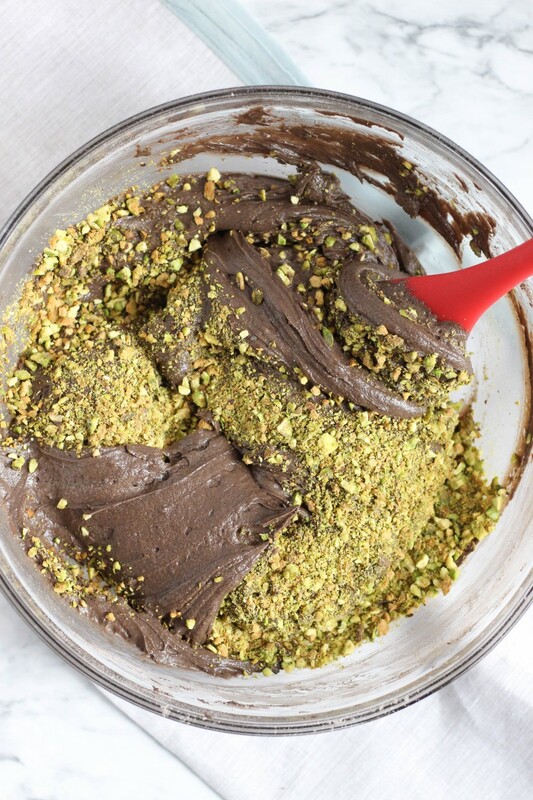 In a medium bowl, stir together the flour, cocoa powder, sugar, salt, and melted butter with a fork until crumbs form. 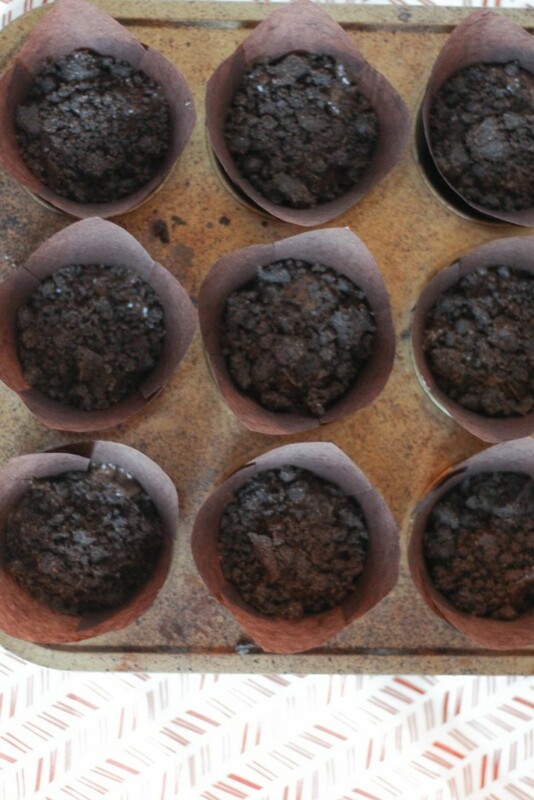 Scoop the muffin batter evenly into your muffins tins. They should be about 3/4 full. Top with a generous sprinkling of the crumb mixture. 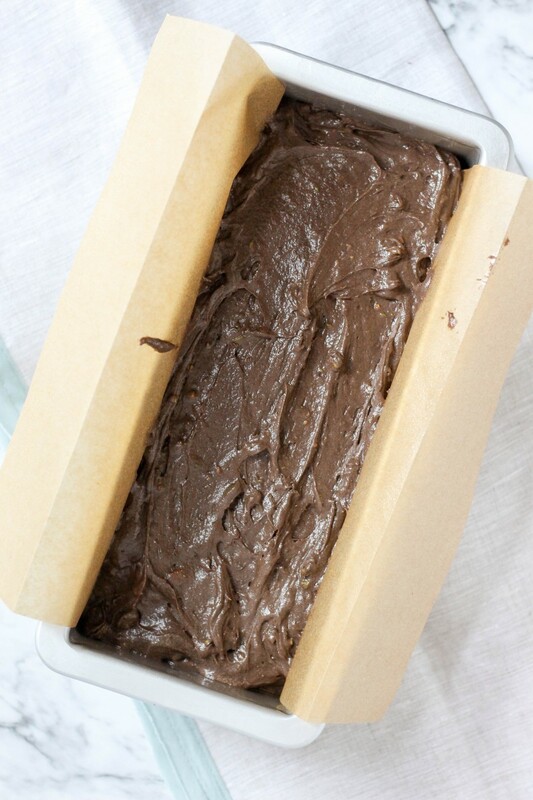 Bake for 20-22 minutes, or until a cake tester comes out clean. Cool and enjoy! Happy Friday everyone! 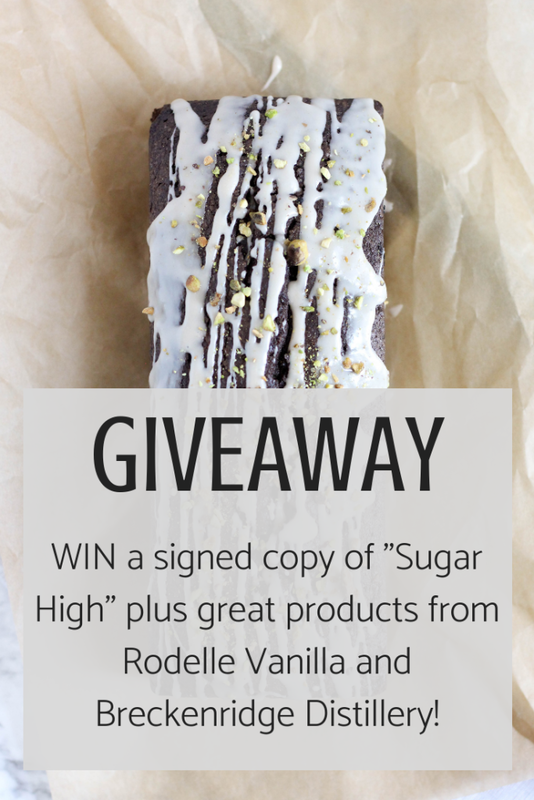 Today I’m announcing the winners of the recent giveaway with Rodelle Vanilla and Breckenridge Distillery! TBH, I’m so jealous I don’t get to keep all this stuff for myself- it’s all really cool. The responses were fantastic, and it was so great to hear from everyone!! So, our two winners of Rodelle goodies are Sally W. & Manda and the two winners of the Breckenridge Distillery swag are Ginger & Jeffrey! Look for me reaching out guys!! Onto the granola! 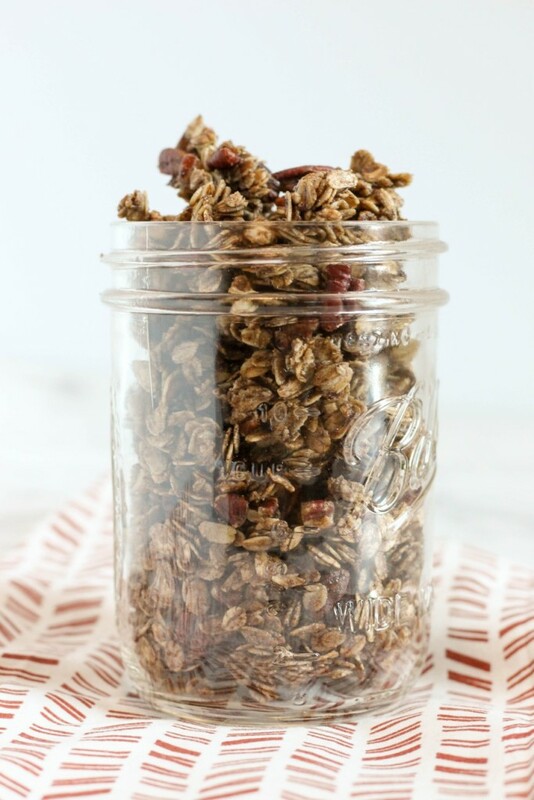 Granola is like. Silly-easy to make you guys. It’s so yummy, and like really customizable. 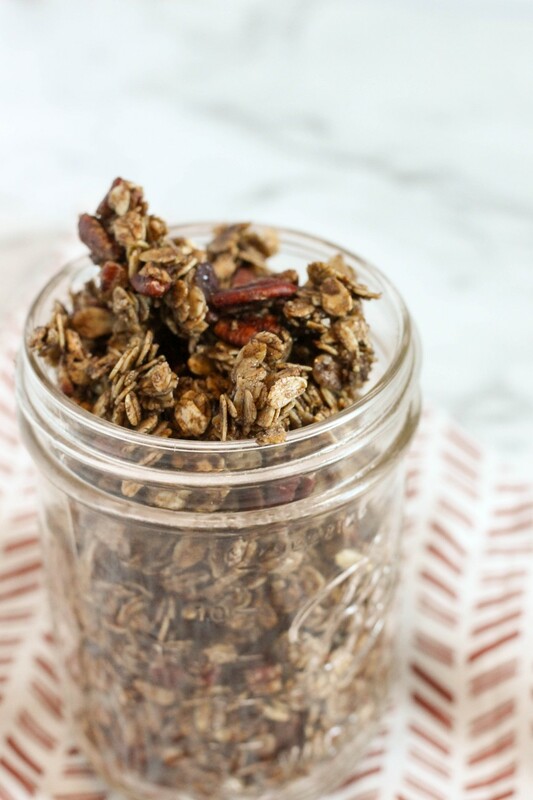 Because I don’t know about you, but it feels like every time I buy a new type of granola, I always wish it were just slightly different. Make it how you want it guys. You want to stick with generally the same amounts of wet to dry ingredients when you customize. 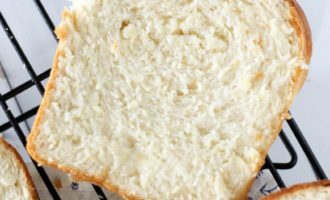 You’ll want to be sure to keep the egg white and oil in tact in this recipe as well- they offer important components. The egg white will help bind things and create a crispy end result, and the oil is another binder in the mix. You can sub butter for oil though! So I’ve added a little bit of cocoa powder here, as well as maple syrup. 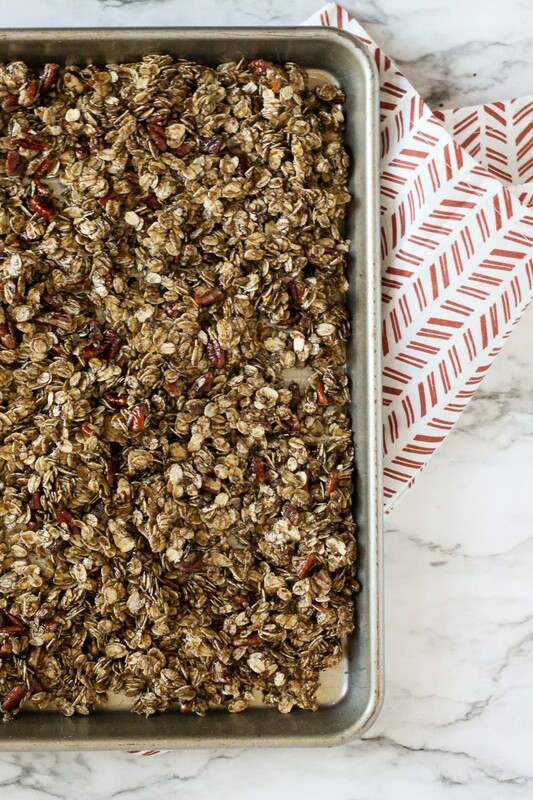 The flavors are my kind of treat, and my husband and I just snacked on this bag all week long- it’s so good! I’ve got to keep things short today guys- it’s about to be a busy weekend! I hope you love the recipe, it’s so easy and really tasty! 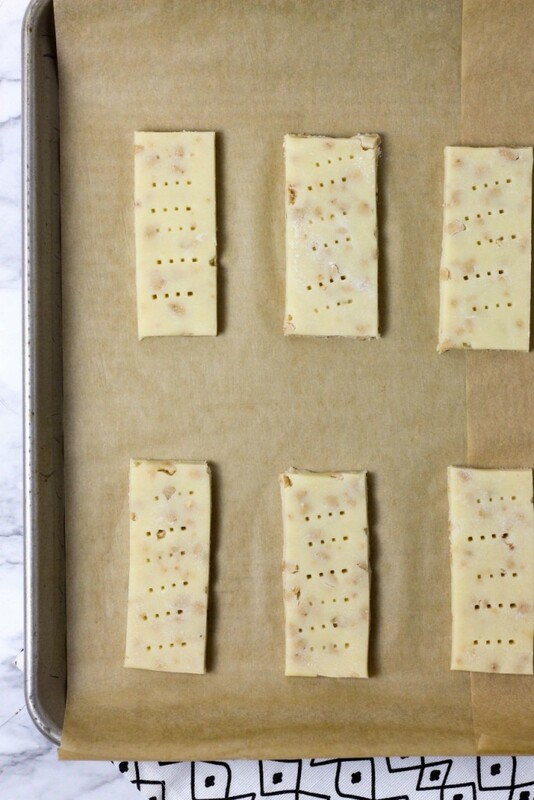 Preheat your oven to 300 degrees, and have a large clean sheet pan ready to go, preferably with edges. 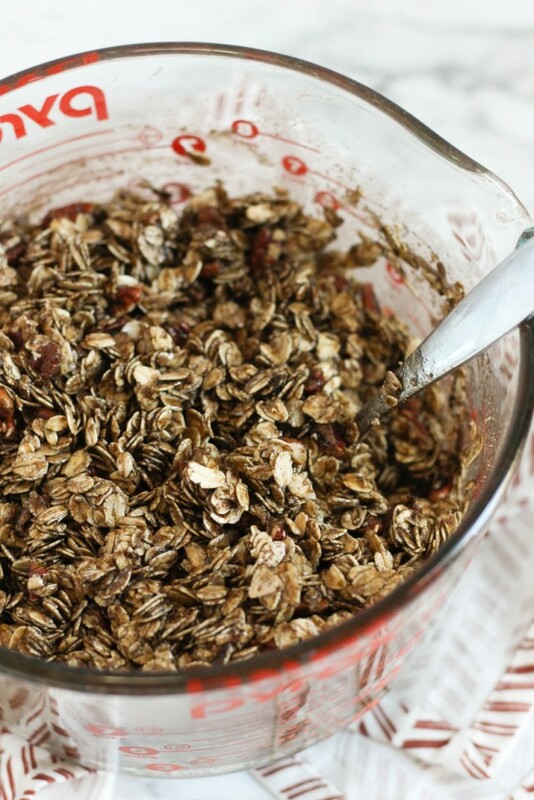 In a large bowl, stir together the oats, pecans, brown sugar, cinnamon, cocoa powder, and salt. In a medium bowl, whisk together the oil, maple syrup, egg white, and vanilla extract. Pour the wet ingredients into the dry, and stir until completely coated. This might take a few minutes, but take your time- you really want everything well coated. Spread the mixture evenly in your sheet pan. Bake for 30 minutes, stirring once during baking. Cool completely in the pan, and then break up to desired size, and store in an air-tight container. Enjoy! 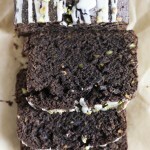 Chocolate Pistachio Cake & “Sugar High” Giveaway! Hey guys! I’ve got something exciting to share with everyone today! Actually two exciting somethings if you include the cake, and we ARE including the cake. Speaking of cake, this is a great one. 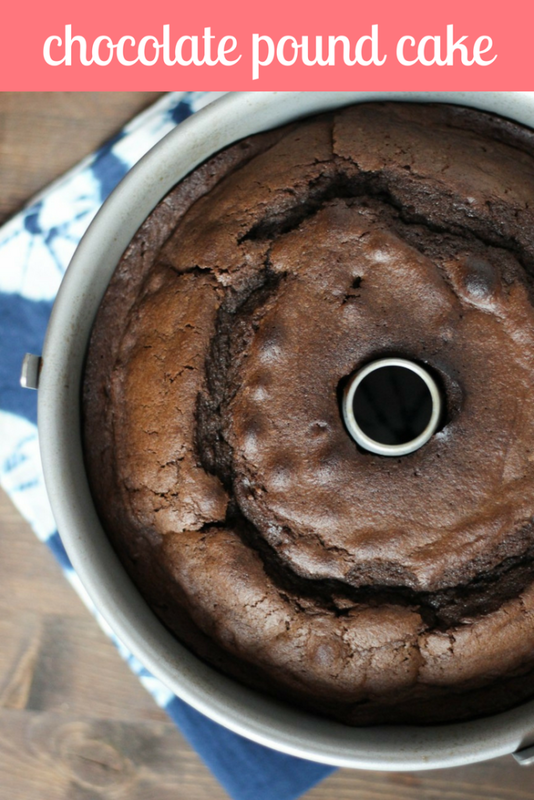 It’s a spin on my classic Chocolate Pound Cake! 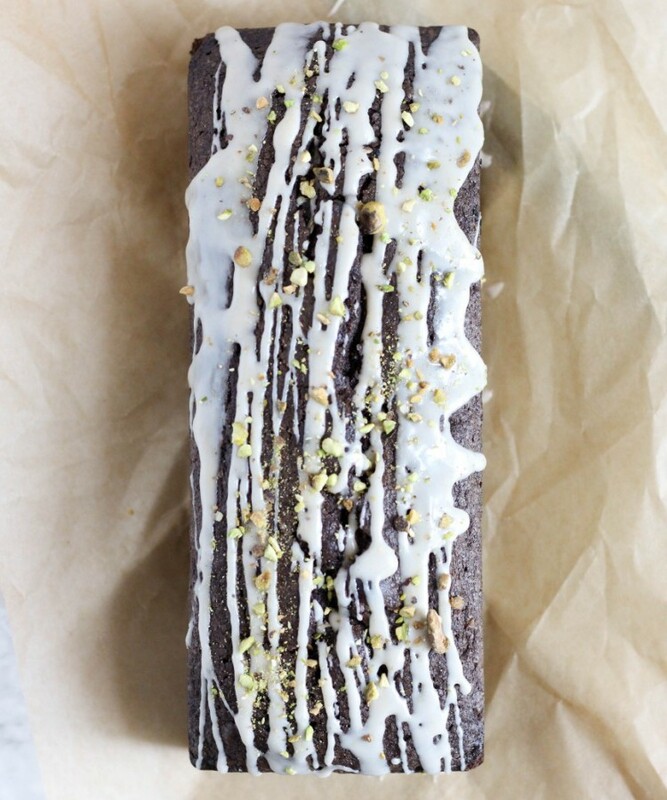 This version is full of chopped pistachios, and drizzled with a sweet vanilla icing to top it off. So starting with the cake, this is a basic pound cake batter. 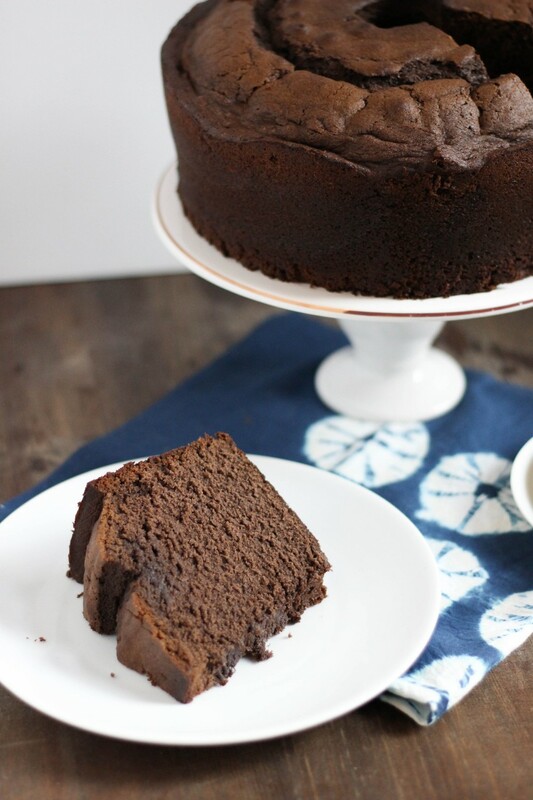 I use dark chocolate cocoa powder to really drive home the flavor, and sour cream keeps the cake moist and tender. 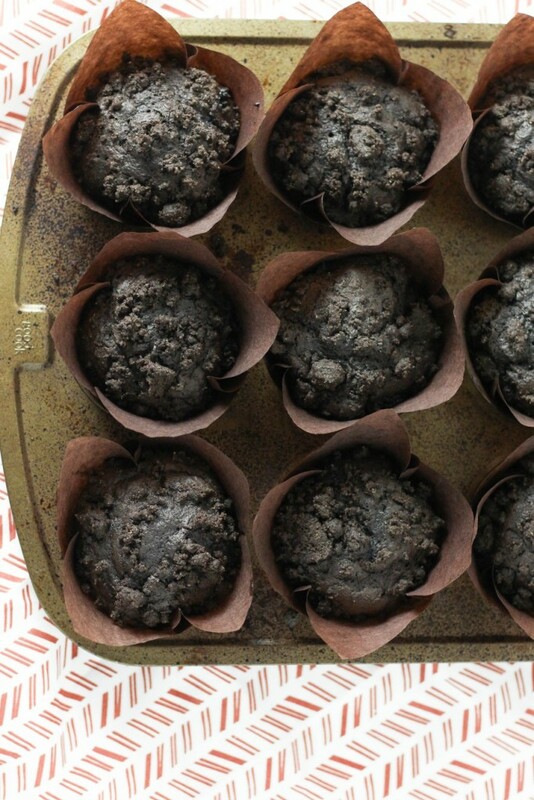 If you haven’t used instant espresso powder before, now is a good time to start. 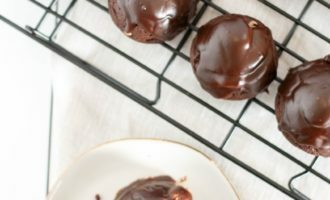 I actually just always have some in my pantry for recipes just like this one- it’s a super easy way to help bring out the flavor of your chocolate dish. Don’t worry- it doesn’t make things taste like coffee when used sparingly! 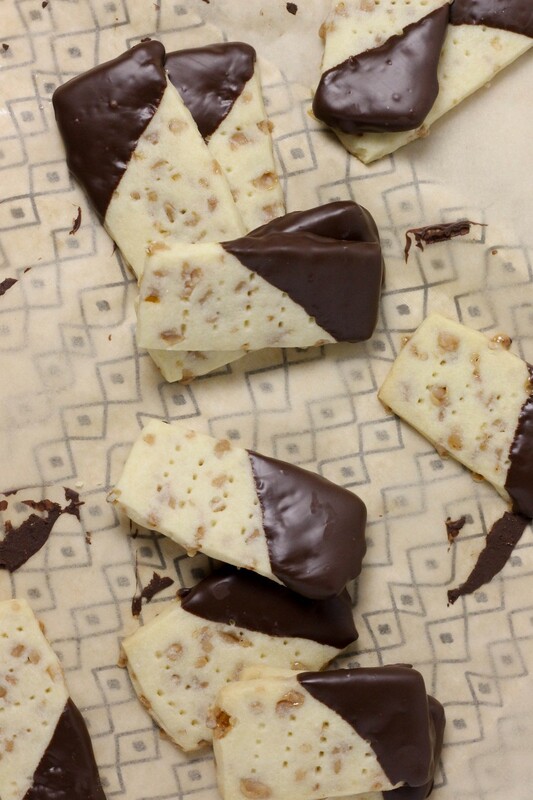 Pistachios and chocolate are an easy combination, it’s a great flavor choice! The end result isn’t too sweet, but it’s got a ton of beautiful flavors that will keep you coming back for more! 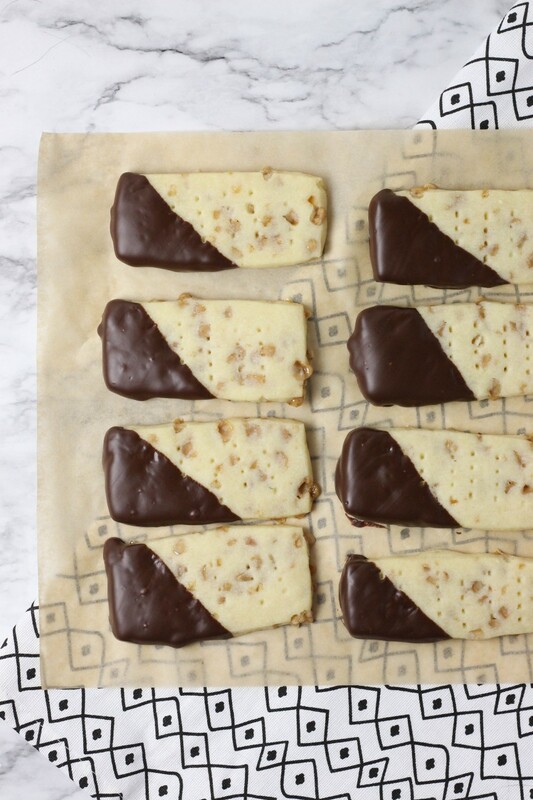 Get the recipe below, and I really hope you guys like this one, it’s one of my favorites!! Now onto the giveaway! I’m so excited to be offering four prizes today! I’m working with Rodelle Inc. and Breckenridge Distillery to bring you guys some serious goodies! I LOVE these brands and the products they provide, and I actually used products from both companies in the making of Sugar High! Rodelle makes some of my absolute favorite vanilla extract- seriously I always have some in my pantry! And Breckenridge distillery makes my favorite bourbon! It’s my go-to for baking because the flavors really shine through well. 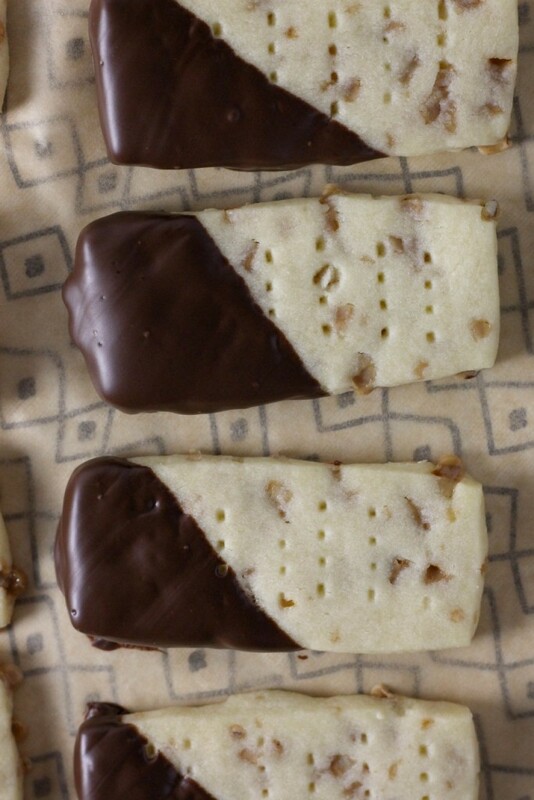 If you’ve ever seen a recipe on my website that included whiskey for a baked good, I used Breckenridge! 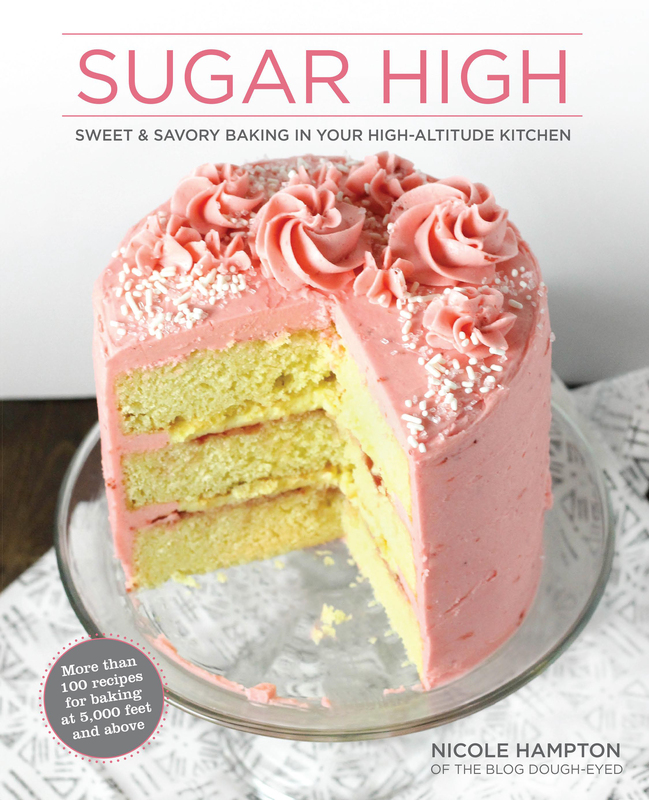 I’ll be choosing 4 winners to receive a signed copy of my new high-altitude baking book Sugar High. 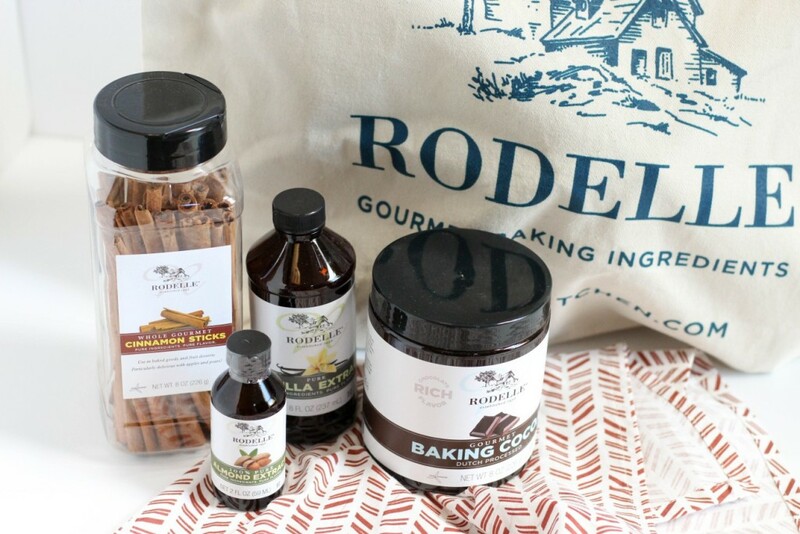 Additionally, two of those winner will be receiving a goodie bag from Rodelle with a bottle of vanilla extract, a bottle of almond extract, a generous container of their fantastic cocoa powder, and a container of their cinnamon sticks, all wrapped in a Rodelle canvas bag! 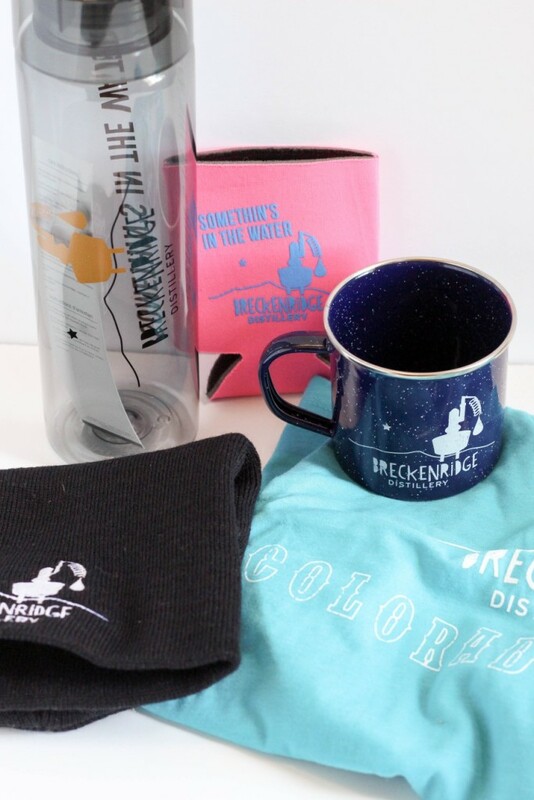 The other two winners will be receiving tons of goodies from Breckenridge Distillery! This includes a t-shirt, a water bottle, a tin mug, a beanie, and a drink koozie! GIVEAWAY HAS ENDED, THANK YOU!! 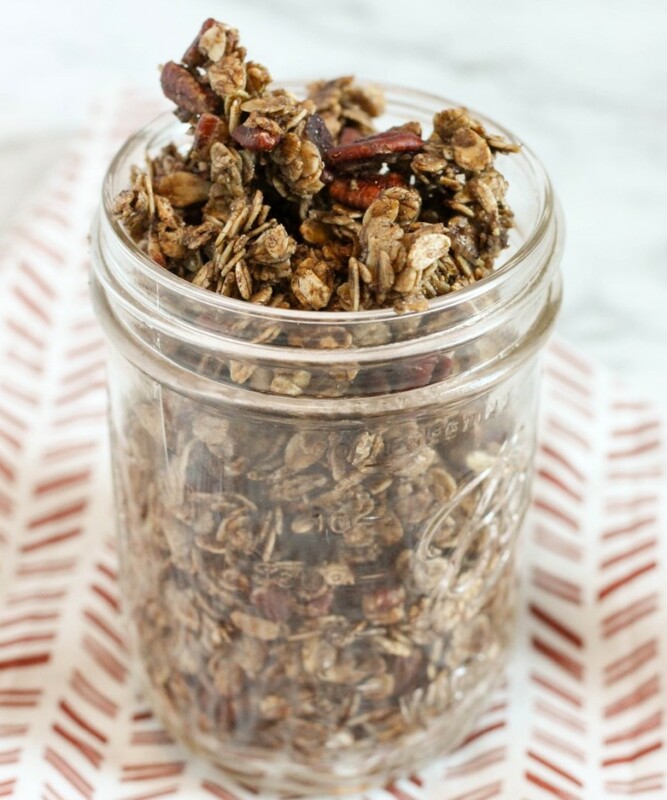 All you have to do is comment below with your favorite way to use whiskey or vanilla extract in the kitchen! The giveaway will run until October 25th at 12:00pm mountain time, and the winners will be selected at random. You must be a resident of the United States to enter. 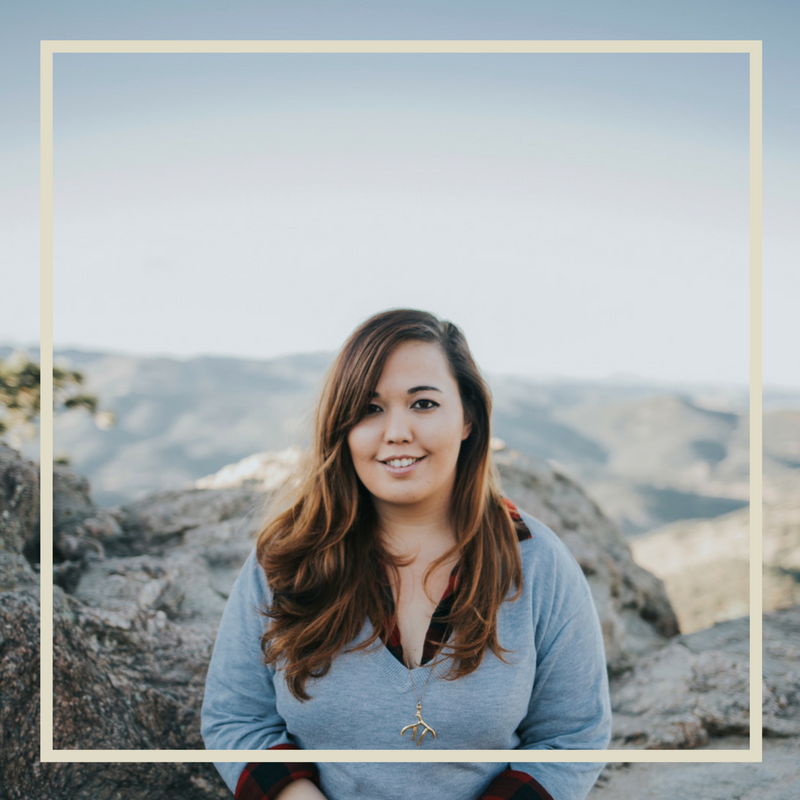 Follow me on Facebook, Instagram, and Pinterest for more information on future giveaways! And check out Rodelle and Breckenridge Distillery on social as well- these are seriously great brands! Preheat your oven to 350 degrees and grease a 9 inch loaf pan. Set aside. In a large bowl, beat together the butter and sugar until fluffy. Add in the eggs and sour cream, and beat until combined. 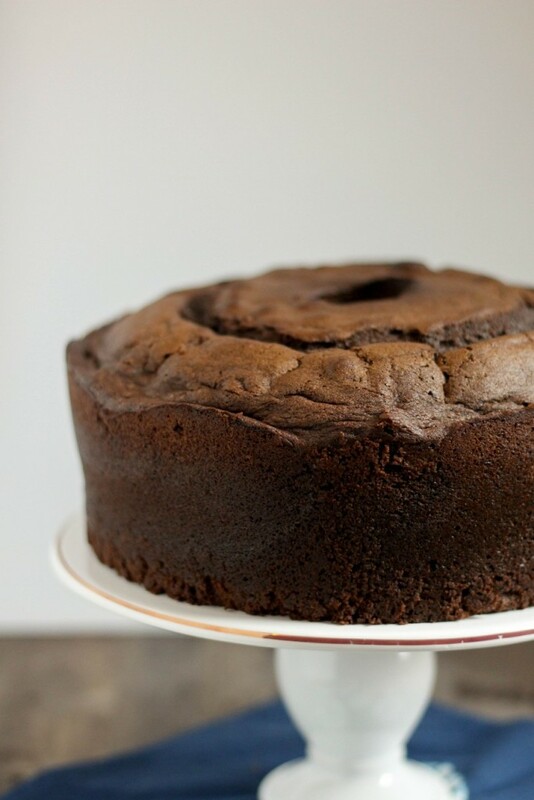 In a medium bowl, whisk together the flour, baking powder, espresso powder, salt, and cocoa powder. Add the flour mixture and milk alternating into the egg mixture, beating well between each addition, until completely combined. Fold in the pistachios. Spread the batter into your prepared pan. 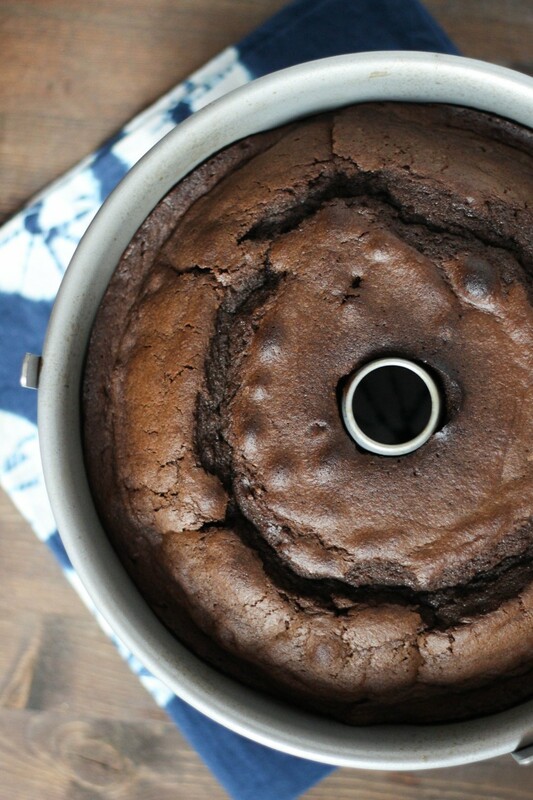 Bake for 60-65 minutes, or until a cake tester comes out clean. Cool completely before icing. In a small bowl, whisk together the powdered sugar, water, and vanilla until smooth. 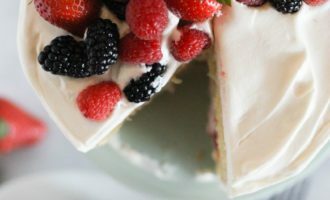 Drizzle over the top of your cake before slicing and serving. Enjoy! You guys probably noticed, I’m on a bit of a pound cake kick right now. I’m not sorry. Today, we’re venturing into chocolate pound cake. 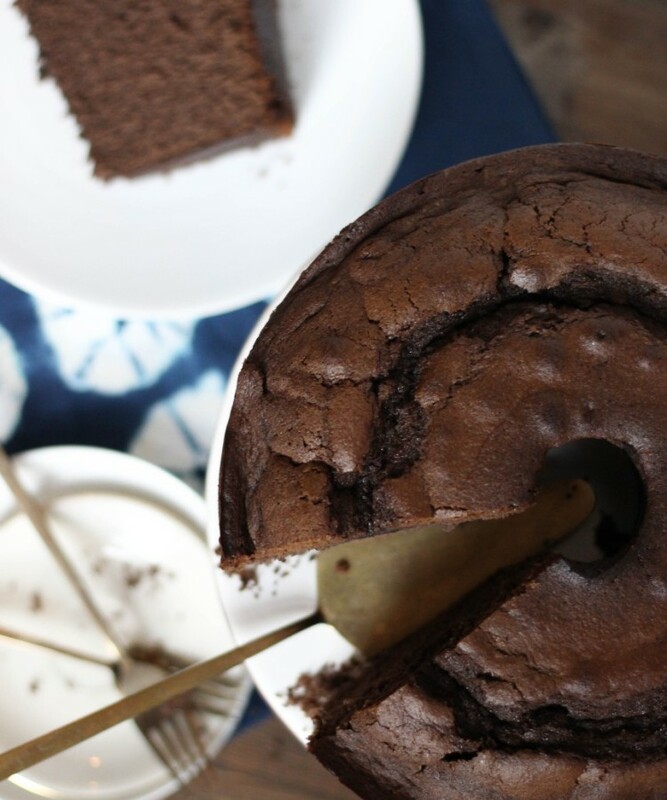 Just a twist on the classic, but similarly simple, lightly sweet, dense cake. 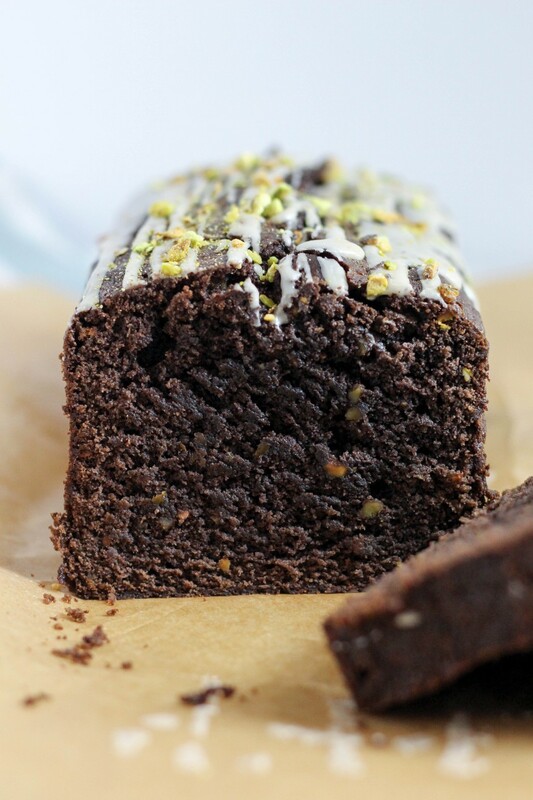 Don’t forget that a great pound cake has that dark, sugary crust and this is no exception! This makes a lot of pound cake. It’s a full 10 cup tube pan, or you can make it into two large loaf pans (but note that they should take a bit less time to bake). What you should know about me is that I’ll eat cake in any form really. But pound cake is maybe the BEST form as far as I’m concerned, and you can do a million things with it. 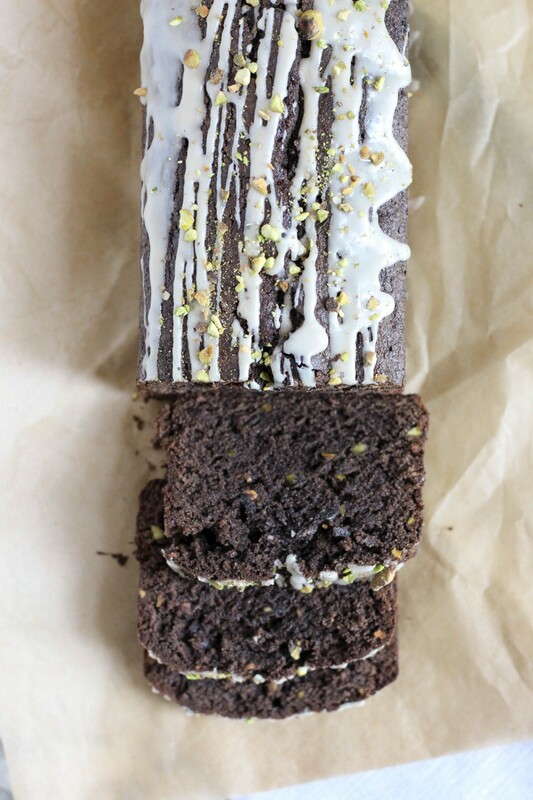 I’ve got recipes for a confetti version, chocolate chip pound cake, cookies & cream pound cake, and the classic on the blog, and I’m telling you right now, more will come. Anyways, so back to this recipe. 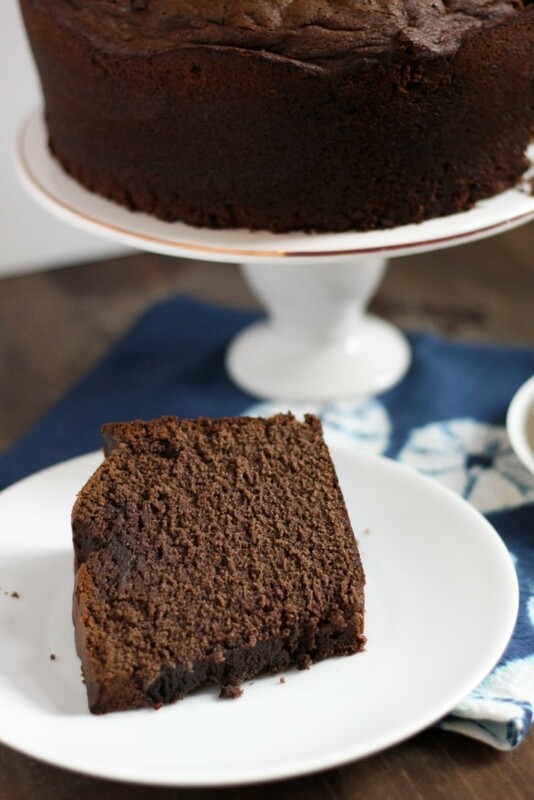 It’s really similar to most pound cake recipes, and I use dark cocoa powder for a chocolate flavor that really shines through. 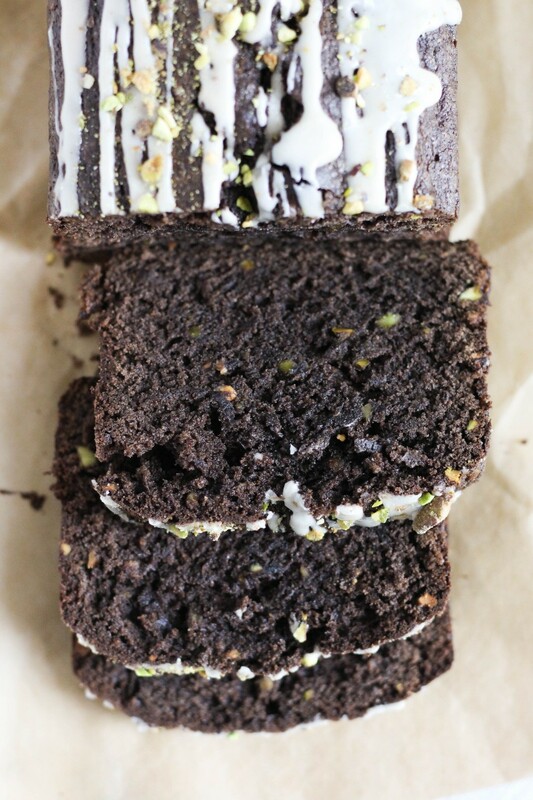 A bit of instant espresso powder and vanilla extract also bring out that chocolate flavor! This is a great recipe for a crowd, and I think you’re really going to love it. Enjoy! Preheat your oven to 350 degrees, and grease a 10 cup tube pan or two large loaf pans. Set aside. In a large bowl, beat together the butter, sour cream, and sugar until smooth. Add in the eggs, two at a time, and then the vanilla, beating until the mixture is fully combined. 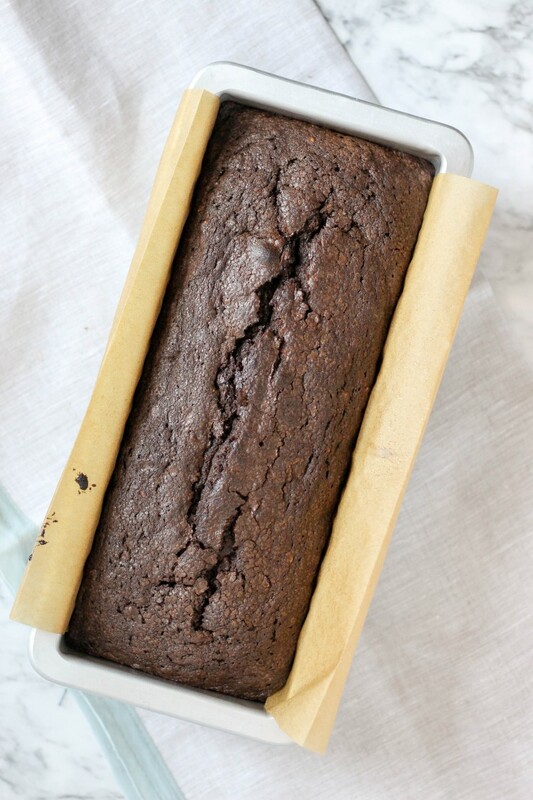 In a medium bowl, whisk together the flour, baking powder, instant espresso powder, salt, and cocoa powder. Add the flour mixture in several additions to the butter mixture, alternating with the milk, mixing well between each addition. Beat until the mixture is smooth- the batter will be fairly thick. Pour the batter into your prepared pan(s) and spread evenly. 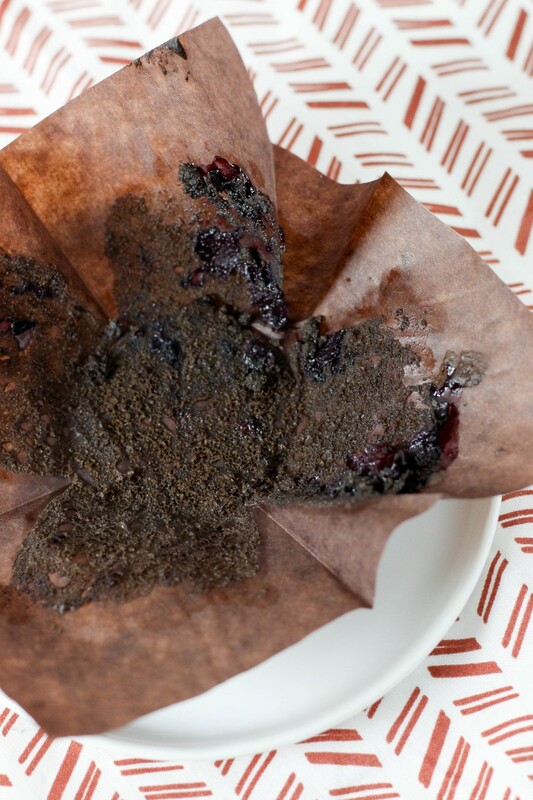 Bake in your preheated oven for 60-65 minutes, or until a cake tester comes out clean. (Note that loaf pans will take slightly less time to bake, start checking at 45 minutes) Cool and enjoy!